When the ground is not too wet and the level of water coming over the falls is just right it is a fantastic place to take engagement photos. The little river brooks down below the falls as the water slows down and the moss growing on the trees and rocks surrounding the area add a beautiful dimension of texture to the pictures. 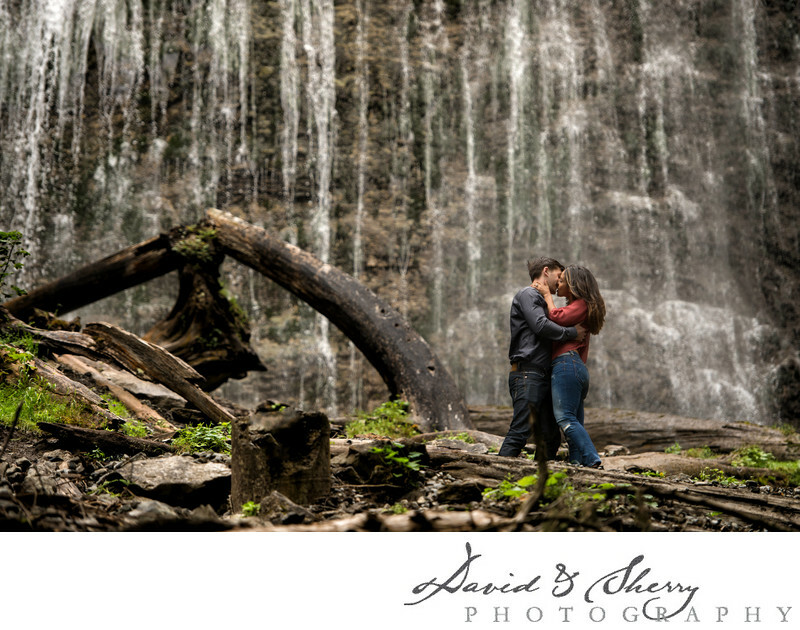 We love to take our brides and grooms for their pre-wedding engagement pictures to this waterfall. There are many nearby wedding venues as well in case you want to sneak away for your wedding day photos. Here are some of the venues close to Bridal Falls. If an indoor reception is desired there are many facilities available one being at Rowena's Inn on the River which captures timeless elegance and romantic sophistication or Harrison Hot Springs Hotel situated on the southern shore of Harrison Lake. The Falls Golf Club does provide breathtaking views and for a rustic celebration Riverfront Lodge and Cabin which faces the might Chilliwack River. The City of Chilliwack has options of various venues to satisfy varied wishes of the engaged couple.